22900 / 22901 Lifetime 6 Folding Table with a 72 x 30 inch Almond / White Molded Top, 1.125 inch Round Bronze Hammer Tone Folding Frame. 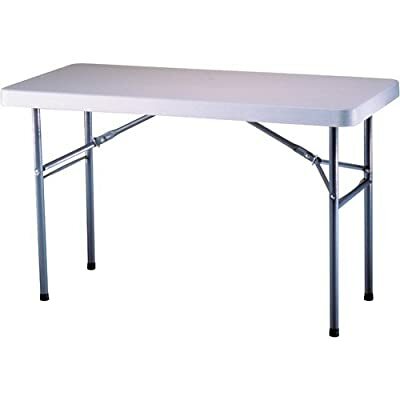 Lifetime ® folding tables are built of high-density polyethylene, which is stronger, lighter and even more resilient than wood. This 6-ft utility table includes a powder-coated, weather-resistant steel frame, built for indoor or outdoor use. View YouTube Video "6 Foot Folding Table"
Our family loves our 6 foot folding table from Lifetime! My kids often take it to school and use it for their projects there. It is very easy to transport and excellent quality. It's sturdy and easy to take up and put down.